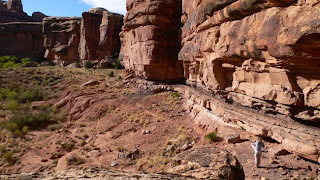 NEEDLES DISTRICT, Canyonlands National Park -- The day was full of promise -- until "it" caught up with us. 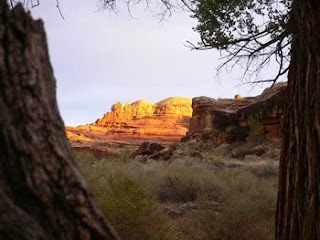 My wife, Lynn, and I had arrived for a long, early October weekend in Canyonlands National Park's relatively unpeopled yet spectacular Needles District, a long way from touristy Moab. The weather was clear and crisp, the kind that makes October so busy in that mountain biking and four-wheeling mecca. 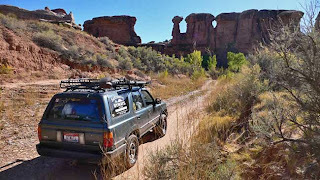 Our 1990 Toyota 4Runner, a trusted veteran of many forays deep into canyon country, was loaded up with camping gear and food. It would see its 20th birthday -- and 215,000th mile -- amid the Needles' intricately eroded, color-banded sandstone labyrinths, which for millennia were home to Anasazi and other native peoples. 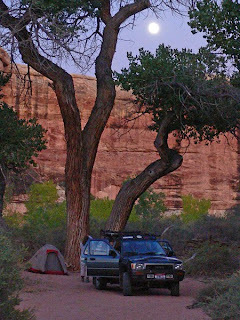 After driving more than 500 miles from our home in Idaho, we'd spent a cold night in a tiny, sandy and exposed commercial campsite ($20) at the privately operated Needles Outpost. It's just outside the Needles entrance station. Now we were ready to revisit the wilds of the Needles. We'd accumulated family memories with our kids here, many years before. On the dash lay our $30 Canyonlands backcountry-camping permit. It was good for two nights at one of only two remote sites at the Salt Creek Canyon's Peekaboo Springs (Google Earth view). We felt lucky to have the reservation. We also had a $5 permit to take the four-wheel-drive road up Lavender Canyon inside the park. The park restricts motor-vehicle access to canyons like Salt Creek, Davis and Lavender with locked gates. Only visitors with one of the few day-use permits issued daily are given the combination to the locks. When we turned south off Hwy. 211 onto the primitive road leading to Lavender Canyon, we were excited to be exploring the Needles again. So we were chatting, admiring the scenery, expecting a great day ahead. I didn't even see the faint rocky track that made a sudden bend to the left, only a mile or two from the highway. I was focused on the landscape, the big picture. Suddenly the ground immediately beyond the 4Runner disappeared. That often happens when a road drops on the opposite side of a hill or embankment, so fortunately I quickly slowed -- but not soon enough. The front wheels dropped off the very ledge that the left turn I'd missed a few yards back circumvented. The frame crossmember plunked down onto the sandstone bedrock. The vehicle was high-centered. 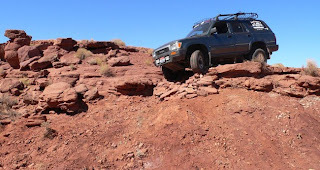 4Runner high-centered on ledge. You can see the rock ramp. 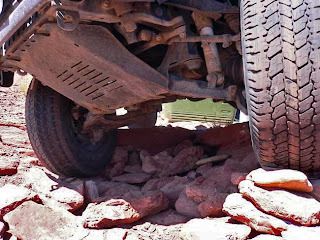 The ledge's abrupt edge prevented backing up, even in low range with the rear locking differential engaged. We were stuck, and we were far from help. More than a decade earlier, alone, in the chilly twilight of an unsettled early November evening, I was edging slowly along the bank of Salt Creek in a Toyota Land Cruiser. That was before the long, serpentine 4WD track along Salt Creek through its namesake canyon was closed to motor vehicles beyond Peekaboo. Then, just as suddenly as on this day, the right-side wheels slipped off the bank and into the creek. The Land Cruiser was high-centered from end to end, resting on the frame and drivetrain. It was growing dark as I worked incrementally to raise the Land Cruiser's massive bulk. As night came, it grew colder. My pants were soaked from sloshing about in the creek. Then it began to snow. I don't recall how long it took, but eventually I got out. The key then was to raise the vehicle off the ground, build up a base beneath the tires, then go for it. The same was true now. Together, these two predicaments constituted two of the three worst I'd ever gotten myself into while driving in the wild. I was beginning to wonder: Is there something between the Needles and me? Just as it did that cold night deep in the canyons of the Anasazi, the solution this day lay in calming ourselves. We had to think the problem through, develop a solution, and work at it slowly, steadily, methodically. The poor 4Runner's front end was pointed vaguely downhill. It seemed best to use gravity to our benefit, and to drive the truck forward once the way ahead was ready. I knew I would have to get ground beneath the front tires to get the frame off the rock. That meant using the factory hydraulic jack (Toyota equips 4Runners with the real thing), located beneath rear seat and much of our camping gear, to incrementally raise the frame. We unloaded the camping gear to lighten the vehicle and allow access to tools. I removed the shovel -- the single most important tool I carry -- from the roof rack. Then we went to work. I raised the vehicle incrementally, an inch or two at a time, with the jack under the frame. 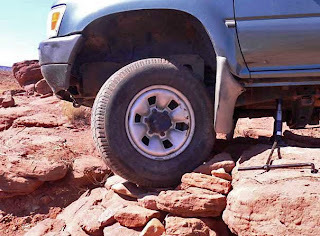 We hauled flat rocks from wherever they lay, and wedged them into the narrow gaps that appeared beneath each front tire. Then I lowered the jack, moved it forward under the frame a few inches, jacked it up again, wedged in more rocks, then lowered it again. Over and over for three hours. Several times Lynn and I strained to move a large boulder from the path that I hoped to take. That required some of the hardest heavy lifting either of us had done in a long, long time. We commented on how impossible -- and dangerous -- the situation would have been had it occurred in the triple-digit heat of summer. At some point a fellow from Colorado came bumping up the road, headed toward Lavender, in a large 4x4 pickup truck. He stopped, and came up to us. 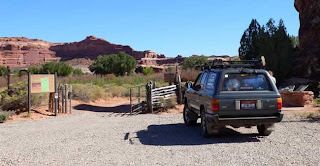 Then he saw the "Backcountry Byways" adventure-driving logo on my 4Runner's rear side windows. "Hey, you guys are professionals!" he just had to observe. "I guess if you do this long enough, it catches up with you." "It" being the odds of something going wrong. We didn't want to keep him from his outing, so we assured him we were making progress and didn't press him for help. There wasn't much he could do at that point, anyway. So, with a generous promise to return in a couple of hours to check on us, he went on his way. crossmember was clear of the rock, if only by a few inches. There was no more we could do. Zero hour arrived. The tires now rested on two crude ramps that sloped downward from the ledge. They would, in theory, provide the pathway for escape. I had two concerns at this point: Whether the crossmember would hit the rock again as the front end lowered while rolling down the ramps, or whether the rear differential "pumpkin" would wedge itself on the ledge. Regardless, we'd done all we could. I got into the driver's seat, determined to go for it. Lynn later said she was concerned the 4Runner might roll over, onto the driver's side. Feeling beat, our hands badly chafed and cut from all the rock work we'd done, we loaded our camping gear again and retreated to the highway. Lavender Canyon would have to wait for another day. 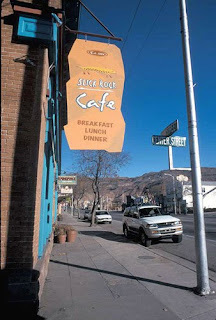 We drove into the park, to the gated entrance to Salt Creek Canyon, a region so rich in ancient Native American ruins and rock art that is a designated archaeological district. Lynn turned the dials of the combination lock, opened the gate, and I drove through. We plowed through deep, soft washbottom sand for 3.5 miles, passing an outbound Land Cruiser and Lexus' version of that all-terrain carnivore, an LX 450. It was a relief to arrive at the two campsites at Peekaboo Springs, where a nearby cliff bears rock art that is centuries, even millennia old. The next day we stepped through the little opening the cliffs that bear the rock art, and hiked 2.4 miles along the washbottom Peekaboo Trail to the junction of Lost Canyon Trail. We lost the trail high on the slickrock, where we no longer found trail-marking cairns. Back at camp, we barbecued steaks, watched the night come, then crawled back into the tent. In the morning, we drove back down the sandy wash, exited the park, and made the long drive home. That photo at Peekaboo Springs with the moon in the backround is awesome Tony ! My wife and I drove to Lavender Canyon last week. We saw the ramp built to free the Toyota 4-Runner. Thanks to Tony and Lynn for setting rocks across that area so someone else doesn't go straight. About a mile from the gate, the road forks and we recommend staying right (right side of the fence). This road is an easier drive and rejoins the other road later. Staying left you go across a steep dirt hill - we made it, but certainly didn't need any more tilt! We enjoyed Davis and Lavender Canyons very much.